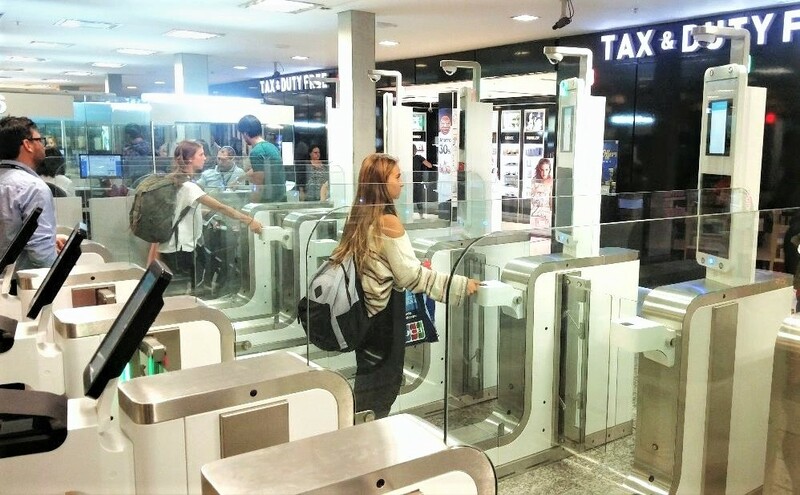 A new Border Control experience designed by Vision-Box is now automating and streamlining the clearance and border passage of Argentinian citizens entering the country using the largest airport of the country. The system is on track to be expanded to departures and 3rd country citizens. The new Automated Border Control (ABC) solution based on biometric technology has been clearing passengers entering into Argentina through the Buenos Aires Ezeiza International Airport since 23 April, date when brand new eGates were inaugurated by Minister of Transportation and Interior and opened to public. The objective of the solution is to enhance the experience of passengers. At the same time, it facilitates border crossing operations, by accurately identifying individuals and supporting oversight by the Department of Immigration and Border Protection. Airport security, traveler management capability and passenger processing capacity have just reached new levels. “The new system that we are launching is a very important advancement”, stated Minister of the Interior Rogelio Frigerio during the inauguration ceremony. “The biometric eGates will not only speed up the transit time of travelers, but will also allow us to gather more accurate information of those entering and exiting Argentine territory using digital technology”. Minister Frigerio also added that the installation of the border control system is fulfilling the Department’s goal of “speeding up border crossings to encourage tourism and investment in the country, while at the same time improving the border’s security levels”. The new ABC eGates at the Ezeiza arrivals terminal are available to passengers possessing an Argentinian passport and who are 18 years of age or older. In just a few seconds they can now self-process though the eGates unattended, following a highly intuitive, user-centric process.. Behind a swift, stress-free passenger experience, a robust passenger orchestration software suite under supervision of authorities compares and verifies the information embedded in the passenger’s passport with a live facial and fingerprint capture and match. Additionally, extensive and accurate background checks are automatically and instantly conducted against INTERPOL, no-fly lists, and internal security lists to make certain that only authorized and lawful individuals are allowed to enter or exit the country. The networked protocol that identifies and matches people, places, and times where border crossings occur follow highly rigorous privacy and safety standards. Minister of Transport Guillermo Dietrich praised the ABC system and the benefit of cutting the border clearance transaction time in half to as little as 17 seconds. “Improving the infrastructure of our airports is significant not only because it is a large public project, but also because the cutting-edge technology improves the clearance time and the quality of the experience that of the millions of travelers that pass through Ezeiza”. Both Horacio Garcia, Director of the National Migration Directorate, and Juan José D’Amico, the Director of the National Registry of People, assert that the new ABC system puts the country’s border technology on par with the most advanced and secure border control systems in the world. Director Horacio says that, “For the past two years, at the suggestion of Minister Frigerio, we tested several initiatives to facilitate and expedite the entry and exit procedure of travelers by applying digital technology tools operating under the Comprehensive Migratory Capture System (SICAM)”. Director D’Amico added that, “we are at the forefront of travel documents, having one of the safest electronic passports of the world. They complete a system that puts us on the same level as the top international airports”. Miguel Leitmann, Vision-Box Global CEO, is extremely proud that Vision-Box is part of this endeavor. “This project is part of our continuing mission of making positive contributions to the safety and security of people the world over. I am extremely pleased that with the installation of the ABC system at Ezeiza Airport and the planned expansion, Vision-Box is able to improve the quality of Argentinian smart border services and increase traveler’s access to them using trusted digital identification technologies”. The fulfillment of all stakeholders goals motivated further steps. A planned expansion will allow Argentinian citizens to use the national ID card and 3rd country nationals to use their ePassports at the ABC system to cross the border. Additional eGates are on track to be installed at Terminal A, with another two slated for Terminal C to process departing passengers. But the modernization of Argentina’s Border Control infrastructure has just begun. It includes a long-term plan to extend the solution to The Buenos Aires Port and to Aeroparque Jorge Newbery, an international airport located near downtown Buenos Aires. This will improve the country’s capacity to manage high-transit air and port entry and exit points in the greater Buenos Aires metropolitan region.